For this month's Crafty Night at my sister's house, it just didn't seem right to make something for January with Christmas just around the corner. However, cards seemed a bit late. What do folks need at the last minute? GIFT CARD HOLDERS! So, I found a great idea, the twisted gift card holder and here's my version. You just put the gift card inside the folds! 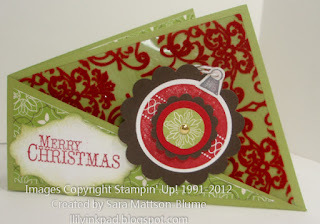 Accessories:1 3/4" Circle Punch, Stampin' Up! Paper Trimmer, 3/4" Circle Punch, 1" Circle Punch, 1 1/4" Scallop Circle Punch, 2 3/8" Circle Scallop Punch, Big Shot, Apothecary Accents Framelits. I used the video by Vicki on You Tube to show me the measurements and steps. 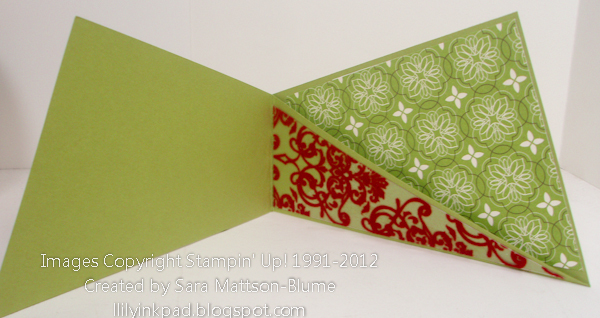 It's really quite easy and this video makes it super clear: Twisted Greeting Card. Good job, I think I can make one now! I thought they were a lot harder. Thanks for the tips on cutting the DP to fit! Thanks for unraveling the mystery for me!